You'd think that since all I ever talk about is tatting, that I don't occasionally dabble in other fibre arts. These days that's true, but I have worked in other mediums. 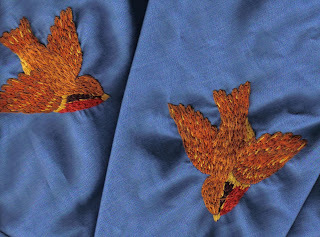 Here are some rather blurry scans of a skirt I embroidered. I took me about a year to do complete this project. It was started at the end of summer one year and was a finished skirt the following summer. Parts of it I'm really pleased with, but other bits I didn't really care for. The birds for instance, I really liked. I blended strands of thread so that the body was one shade lighter than the wings and tail. Crumpling the skirt to fit it in the scanner doesn't help, but you get the idea. 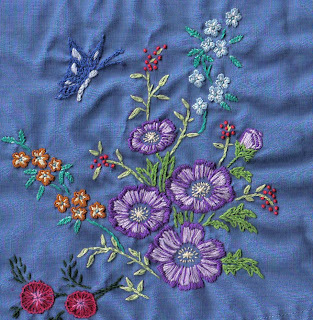 The border of the skirt front had 3 separate bouquets of flowers, but to give it a bit of continuity I cut pieces of the flower transfers and placed bits of them in each bouquet so while there were 3 areas of flowers they sort of bled into one another. I sort of like this section but the pink flowers detract from it as do the wine red flowers in the corner of the picture. Unfortunately, these were some of the flowers that I chose to intersperse. The Queen Anne's lace and leaves were nice and while you can't see it in the scan. the buttercups had nice textured stitching. This is the last section of the skirt. The red and brown butterfly on the left is hideous. 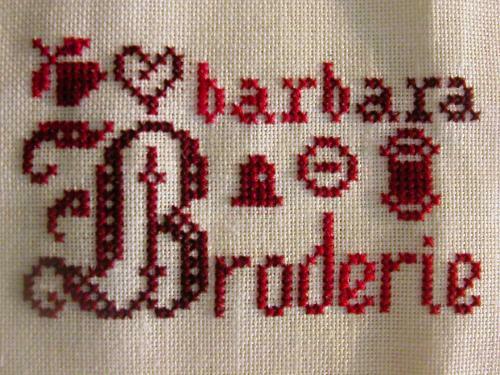 It was ugly before I stitched it and my colour selection of red and brown didn't improve it. the colours blended well with the flowers but they didn't liven up the butterfly itself. The other sort of morning glory shape flower was also incorporated into each section. The colours didn't work so well in some of the bouquets. This was one of those projects that I enjoyed but it took a huge amount of time and it was made for me. The skirt shrunk and it no longer fits (that's my story and I'm sticking to it). I am not willing to part with it, mostly because I don't know anyone who will appreciate the effort that went into it. The embroidery, since it follows along the edge of a circle skirt is curved along the bottom edge and isn't suitable to be cut up and turned into pillows or some other practical object so every year when I do spring cleaning I pull it out, look at the work that went into it and contemplate other uses for it. Then I fold it up and stuff it back in the cupboard. The embroidery - they are beautiful. This is one of those things that I want to learn how to do but kept putting it off. WOW! I totally understand! You put a lot of work into that! You should be proud! It's beautiful even with all the things you pointed out it's still beautiful! I'm going to share a link to your post to my hand embroidery group I'm sure the ladies will love to see it! That makes me sad that you can't wear it though! How did it shrink? I'm always wanting to embroider on clothes for myself but my fear is similar to what happened to you that I'd put all that work in and then either not like it or it won't fit me! You could always frame the skirt in a position you like and that way it could be seen and yet kept? Maybe a shadow box type thing? This is beautiful.The birds are amazing. I love how you blended the colors. 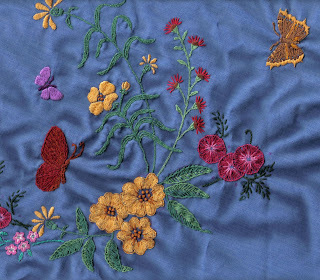 That is such beautiful embroidery. Excellent work! 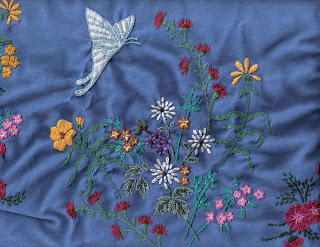 I think it's quite difficult to do embroidery because a lot is free-hand. Maybe one day when I am quite determined I shall give it a go. Ya know I was wondering is there enough room between things that you could cut it apart and maybe applique it onto something else? I just hate that it's in a cupboard! It's too pretty to be stored away!